Physically measures approximately 44” so should be OK for around a 40” chest. A typical later war multiple panelled front and rear. The leather is in very good '+' overall condition retaining amost all of the original chromed finish and excellent flexibility. There are no tears/repairs or damage and only minor surface wear and crazing. All zips are are original with Air Ministry marked examples at the cuffs and a 'Lightning' main zip. All retain their leather pull tags. 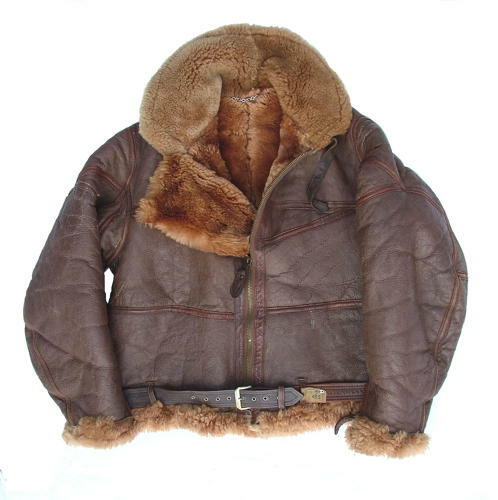 Excellent mid-length dense brown fur lining - even at the waist and cuffs. The jacket has the original belt, riveted leather hanger and collar strap/rings. There are minor soft verdigris deposits to the underarm vent eyelets. This can normally be removed very easily using cotton buds soaked in methylated spirit. This is an excellent lightly used example as it is but would look even better with a light leather dressing. Recommended! Stock code J22042.